CHPA student Megan Newman alongside the totem poles at the entrance to Shq’aphut, the Aboriginal Gathering Place at Vancouver Island University. 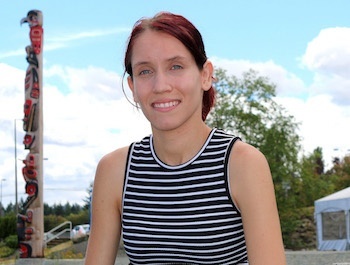 Students who want to study health promotion for Aboriginal communities can now attend a Vancouver Island University (VIU) certificate program for half the cost. One-time funding from the Ministry of Advanced Education means tuition will be halved for the next round of the Community Health Promotion for Aboriginal Communities (CHPA). The CHPA was created in response to the concerns of the Island’s First Nations communities to have qualified personnel assist with members’ health needs. The program, developed in collaboration with the Nanaimo-based Inter Tribal Health Authority, provides training in community development, health education and promotion, and fosters an understanding of the social elements of health in First Nations communities. The CHPA began last year; up to 25 students can enrol for the part-time program’s next iteration, which runs from September 2016 to June 2017. The program is offered mostly online, with in-person weekend institutes taking place at VIU’s Parksville campus every six weeks. Students are also required to take a six-week practicum session; most of these are based at Aboriginal communities on Vancouver Island. That flexibility came in handy for Megan Newman, who undertook her CHPA studies during the past year while living in Coquitlam and working as a patient care co-ordinator at a Vancouver dental clinic. Rose Patterson, another CHPA student, refers to her experience in the program as “fantastic, emotional and rewarding.” Patterson, a member of the Nisga’a Nation in northwestern B.C., was adopted as a child by a non-Aboriginal family. The CHPA, she says, has helped her blend these two worlds. Applications for the CHPA are now being accepted. For more information, visit the CHPA online at https://www2.viu.ca/pdt/certificates/chpac.asp or contact Coordinator Linda Young at linda.young@viu.ca<mailto:linda.young@viu.ca>. Access to VIU’s Community Mental Health Worker certificate program has also benefited from one-time B.C. government funding.